Help us celebrate our 3rd birthday in the Baltic Triangle and buy some great Christmas gifts all made by our very talented studio members. 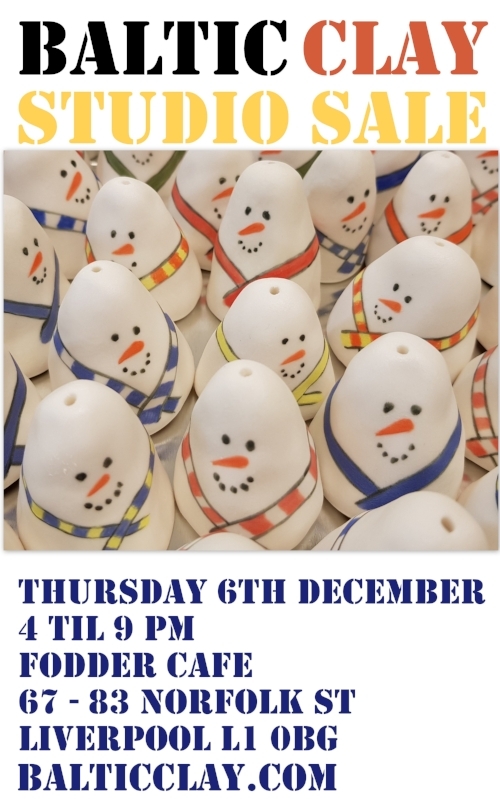 Hosted by Fodder Cafe, join us for nibbles, music and gifts! 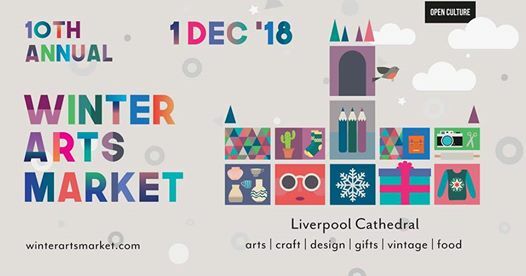 A total of 6 of our studio members are taking part in this year’s Winter Arts Market at the Liverpool Cathedral on Saturday 1st December. 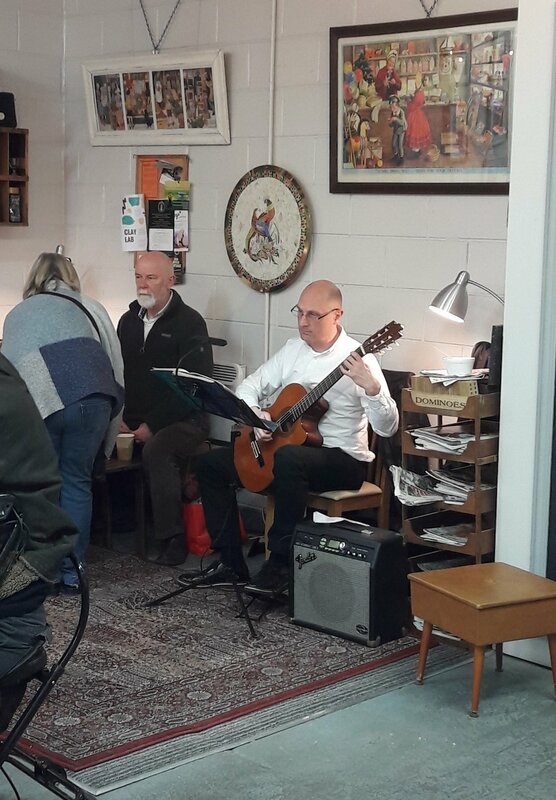 For the first time , we will be having a Baltic Clay stand featuring work by 4 of our studio members, Andrew Sherriff (Sherriff Clay), Louise Waller, Ross Makinson (Gaffe Ceramics) and Karl Atkins, plus information about what we offer at the studio. Two other studio members, Poppy Elmhirst and Kath Flaherty will be exhibiting separately. It’s a great place to get Christmas gifts and spend the day! One of our studio members, Jane Loveday, is showing her sculptures at the prestigious Kunsthuis Gallery in North Yorkshire til the 23rd December. Well done Jane! Some of our studio members have work on display, and for sale, at The Nest on the Royal Albert Dock.Just up from Tate Liverpool, it's a great place to buy work from local artists and designers in time for Christmas! Work by Louise Waller Ceramics, Chris Turrell-Watts, Jane Loveday, Taehoon Ceramics and Sherriff Clay. The fundraiser was a huge success! Over 230 people patiently queued to get their handmade bowl and handmade scouse! A huge thanks to our studio members who both made many of the bowls and helped run the evening, to our many local potters who made and donated around half the bowls for sale, Becky Griffin who produced the beautiful artwork for the event, the Scouse Life for the great T shirts, Fodder Cafe for the great scouse, Chris Callender for the lovely live music and especially to everyone who came and supported two, great local charities: The Whitechapel Centre and Savera UK. We raised just over £1130 for them each! We're having a Studio Sale! Lots of great pieces made by our talented Studio Members, perfect for Christmas direct from the makers! Andrew, Kathy, Louise, Kath and Chris will all be exhibiting and selling at the Summer Arts Market this Saturday 17th June. We're excited to be part of LightNight 2017! This year's theme is Time and artists often get asked "How long did it take to make?". Well, now is your chance to find out, so join us for an evening of timed challenges, fun and games and see your work in our pop up gallery! Then come and see our studio in action! It's on Friday 19th May, from 5 til 11 pm. Suitable for all ages. Start at Fodder Cafe on 67 Norfolk St for the games and see us in our studio next door! Scouse in a Bowl was an amazing success raising just over £1000 for the Whitechapel Centre! The cafe was packed with people enjoying their scouse and choosing their bowl to take home with them. Huge thanks to everyone who made it possible including our friends at the Lark Lane Pottery and The Pot Factory who donated beautiful bowls for the event. We're getting ready for our first fundraising event at the studio! All the members of Baltic Clay are busy making a series of beautiful bowls . Turn up at the Fruit and Fibres Cafe on February 24th, pay for some scouse and have it served in one of our bowls which you then get to keep afterwards! Proceeds are going towards the Whitechapel Centre which is the leading homeless and housing charity in Liverpool. Here's a lovely video of some of the work on display for our first birthday celebrations! We are celebrating our first year in the Baltic Triangle with a party which includes our first Studio Sale and a chance to see the studio and works in progress. It's being hosted by our friends at Fruit + Fibre Workshop and Cafe on Norfolk St on Friday 25th November, 6 til 8 pm. Hope you can come. I was asked by the Liverpool Biennial to help produce several ceramic pieces for one of their international artists, Jumama Manna who was selected to take part in this years' Biennial . Jumana is based in Berlin and shipped over a large plaster mould which I used to construct several bisque fired pieces. She then came over to the studio to glaze them and after firing , arranged them for display at Tate Liverpool. It was a challenging and enjoyable collaboration, picture below of the finished piece. Here is the finished video produced by LBM. Clay Lab was an amazing success! Over 600 visitors to our small studio who shaped and created our huge landscape of clay made of 1250 kg of clay donated by Valentine Clays and filmed by Kevin Casey from LBM. Come and see us for our amazing interactive event called Clay Lab as part of this year's Light Night. It involves 100 bags of clay and your imagination! We have covered a huge table with mountains of clay that can be shaped and moulded into anything you want! Suitable for all ages. No need to book, just turn up between 5 and 11 pm on Friday 13th May at the studio. Entrance is through Fruit and Fibres Cafe which is on Norfolk St just off Jamaica St in the Baltic Triangle. Our event is listed in the official Light Night brochure so look forward to seeing you! Please note that this event is being filmed and will eventually be used to promote the studio and it's activities. Many thanks to Valentines Clay for their generous donation of clay and to LBM for filming the event. We are very happy to be part of Liverpool's Light Night event which takes place on Friday 13th May. Light Night is an annual event which involves over 100 of the city's cultural organisations in a series of special exhibitions, performances and events. Baltic Clay will be hosting a very special, one night only, event in our studio which will involve 100 bags of clay, sound , light and video which everyone can get involved with! The theme of this year's Light Night is Experiment so expect the unexpected! More details to follow..